Win Tix to Gang Gang Dance Saturday 11/15! Get your art on this weekend and check out Machine Project at LACMA; then walk down the street a bit to the El Rey for Gang Gang Dance with Marnie Stern. The art-rock-primitive-sound-architects are fantastic and put on a strong, visceral live show. To win tickets, place a link to your favorite work of art in the comments below. This was so much fun with the B-52’s contest (now closed, thanks for playing!) that I’d like to try a new iteration. Here’s info on the show. My favorite would be Terence Koh’s ‘snow’ filled room at Peres Projects this past May (his exhibition titled “The Whole Family.” Amazing! Thanks so much for having such a cool contest!! 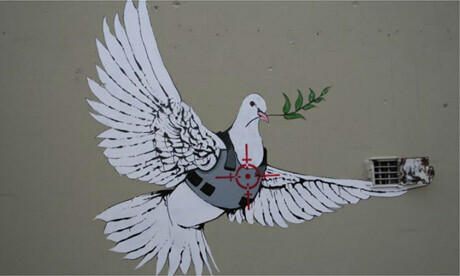 work by Banksy in the West Bank in Israel is my favorite. Pretty much anything by Banksy is great.